Yesterday I was thinking to make some paratha and at same time while browsing on facebook I saw paratha picture in a group that was looking yummy. I read the recipe that was very easy and I had all ingredients in my kitchen like egg and cheese etc. Then I prepared Egg and Cheese Paratha with a little change, and no doubt the taste was supper yummy! I will must say this Pakistani Food Recipe would be great for breakfast and Sehar time in Ramadan. You can eat it alone or with some condiment. 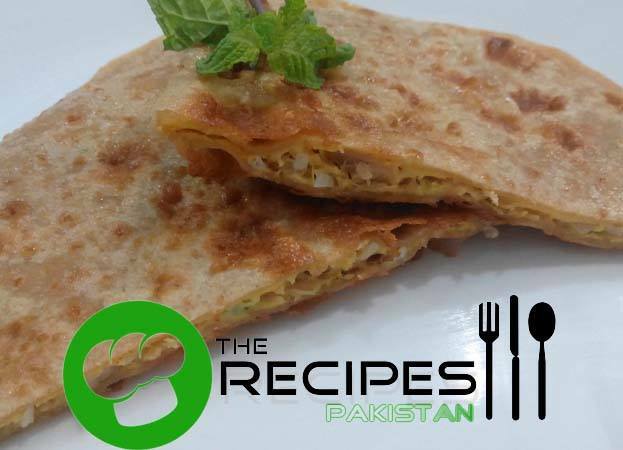 Also try out Chicken Roll Paratha, it has a tempting taste. Beat eggs; mix in cheese, chicken, onion, green chilies, salt, red chili and green coriander. Divide dough into 4 balls. Roll out one ball and put on hot griddle. After 2-3 seconds when you see paratha is cooked a little, turn over the side. Immediately pour 4th part of egg batter on one side of paratha and quickly flip the other side over and egg and press gently. Drizzle oil/ghee and turn over and side. Drizzle oil/ghee on top and transfer to ovenproof dish. Microwave for 1 minute. Yummy egg and cheese paratha is ready.